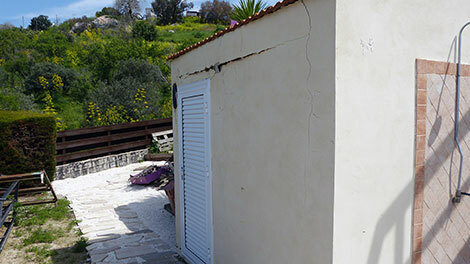 A CREEPING landslide is slowly destroying a further five homes located on a slope just below the church in the picturesque Paphos village of Armou and there are ominous signs that their homes will be declared uninhabitable. In November 2012, a development of six houses built lower down the slope by JNM developers in 2004 were declared unfit for habitation, a banning order was issued, the electricity supply was disconnected, and the six families were forced to leave. Permits to build the six houses in a residential zone (H4) were granted, which can be seen in the Banning Order issued by the Paphos District Administration Officer in November 2012. In addition to the six houses, a further five homes in the residential zone, all of which have been issued with Title Deeds, are suffering damage caused by the same landslide. Their owners are constantly patching up damage to their walls, patios, drives and utility supplies – and they’ve filled in their swimming pools. One of the access roads to houses has been closed and others have cracked and are frequently patched to keep them in a usable condition. Although the five houses remain habitable, damage has accelerated this year which their owners believe has been caused by heavy winter rains. One of the homeowners I met, David Coppin, knows he will be forced to leave when his home becomes uninhabitable and move into rented accommodation. He is selling much of his furniture and putting the money aside to help pay the rent when the inevitable happens. Although his home may have some value, no-one will be willing to buy and Mr Coppin and others affected have written to the government seeking their help. In 2013 Mr Coppin commissioned Geoinvest Ltd. to undertake an independent investigation of his land. The company’s comprehensive report noted that “The whole area is occupied by the bentonitic clays, which belong to the ‘Kannaviou Formation’ of Upper Campanian – Lower Maastrichtian (Upper Cretaceous) age”. 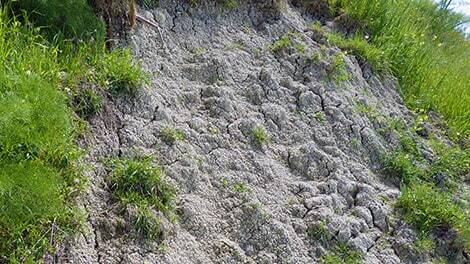 Bentonite was clearly visible as I walked around the area. When is residential land safe to build? These maps are kept under lock and key by the Planning Department; they are not available for public inspection! Why do the Paphos District authorities allow land that is clearly dangerous for building to be classed as residential rather than declaring them ‘White Zones’? Could it be the backlash they’ll receive from landowners and demands for compensation when they realise their land is virtually worthless and they’ll be unable to sell it for a decent price or use it as loan collateral? Planning Departments have an obligation to advise potential purchasers whether residential land is safe and prohibit building in dangerous areas such as those in Armou – and compensate those whose homes, built on land that should have never been designated ‘Residential’, collapse around them. Maps showing unsafe land kept under lock and key and not available for public inspection says it all really. What a way to run a ballroom. I wonder if the planning department can be challenged in a court of law over this and be found to be guilty of conspiracy.